Photo Credit: CNS/courtesy Most Sacred Heart of Jesus Parish - Hadly Nickell and Hays Nickell pose by the "Blessing Box" on the grounds of Most Sacred Heart of Jesus Church in Jeffersonville, Indiana, which was set up in January. The pastor said parishioners want to help individuals and families in need through the stand-alone structure, filled with nonperishable food items and toiletries that anyone in need can access at any time of day. So the pastor of Most Sacred Heart of Jesus Parish in Jeffersonville, Indiana, embraced a plan from one of the parishioners to help individuals and families in the community when they don’t have enough food for their next meal. 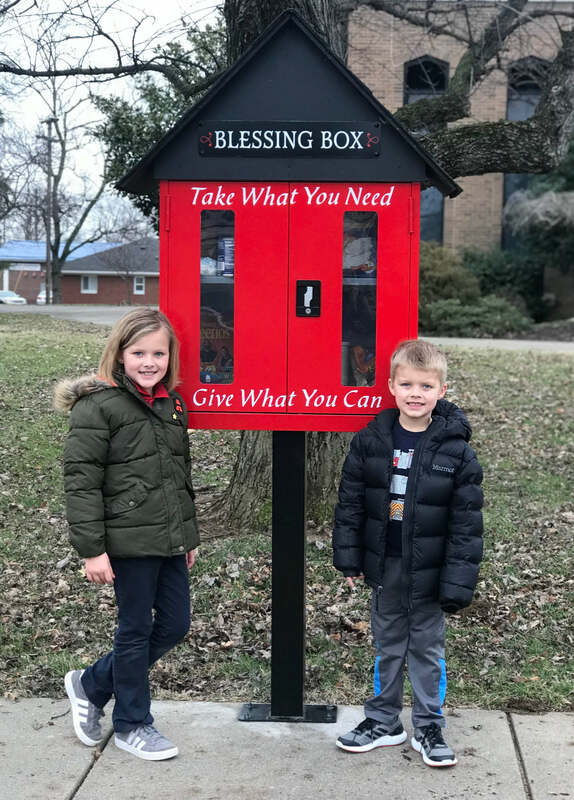 Set up in January, the “Blessing Box” was built by a parishioner and has been stocked by donations that include rice, pasta, canned goods, cereal and macaroni and cheese. Personal items such as socks, toothbrushes and deodorant have also been donated.